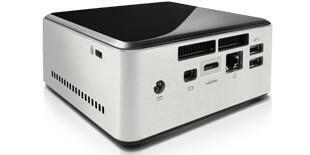 This NUC has been a demo model which I could buy for a friendly price from a friendly supplier. Like all NUC's, there is no VGA output, only HDMI. This particular NUC has a mini-HDMI connector. In order to put Linux on to it, I first had to buy a mini-HDMI to HDMI adapter. NUC systems require just a small amount of electrical power, so using one as an KMV-server to replace several real hardware servers is increasing your electricity efficiency. The i3 processor allows for running a real hypervisor, so the virtual machines will fly at almost native speed. Because systemd is imho not the Unix way to go, and the current Debian version is based on systemd, I preferred not to install Debian as host OS on this box. In the '90-ies I used to run Slackware on my boxes without any problems so I decided to give Slackware a change as host OS. KVM requires a 64bits version of the Linux kernel, so I choose to install Slackware64. There is no need to install the full Slackware64 distribution, only several packages of the A, AP, L and N series are required. Download qemu from qemu.org, I downloaded qemu-2.2.1.tar.bz2. Configure without need for X (no need for it on a headless server). This way qemu is installed in /opt/qemu-2.2.1 with a symlink to /opt/qemu-latest. Yes, it uses /usr/sbin/openvpn to create and destroy the tun devices. This was quite a surprise, but it works [tm]. Edit the file rc.inet1.conf to setup the bridge. Check the network configuration with the command ifconfig. This is an example of a vm with two discs (running a Raid-1 vm as a development and testing method for preparing a "real iron" machine which will get two real discs in Raid-1). The line -vnc 192.168.1.2:1 is so I can have vnc-connection to the console of the vm, and expects the kvm-server to run on ip-address 192.168.1.2. If your server runs on a different ip-adress, then change this line accordingly. Mount SSD partitions with options noatime,discard.